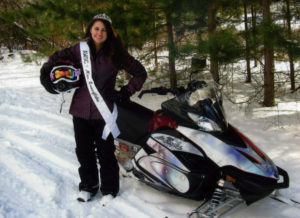 Several years ago we got the chance to be part of the Miss Snowflake Queen pageant, this is put on by the Wisconsin Snowmobile Association for young women. Each year a new young woman (16-21) is selected to represent the association at various events. 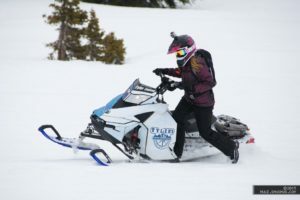 Tyler's Backcountry Awareness recognizes how much work these young ladies put in by offering to spend time sharing our Western culture with our Midwest sledding family. It is a fun trip including some basics in managing avalanche terrain as well as a chance to see a part of the world many have not. The experience is always different while the former Miss Snowflake tags along with a couple of her friends. Chelsie Popp (2013-2013 Miss Snowflake) sent a few words about her experience. Here is what she had to say. 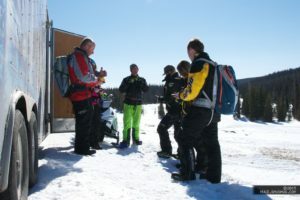 I have always enjoyed snowmobiling in the mountains and have been lucky enough to have numerous opportunities to ride out west over the years. I thought I knew all about riding in the mountains but I definitely got a reality check when I made my first trip to the Snowy Mountain Range in Wyoming to ride with Brian Lundstedt from Tyler’s Backcountry Awareness. This was a trip that was earned after my year as the Association of Wisconsin Snowmobile Clubs Miss Snowflake. I had no clue what I was in for on this trip. The knowledge gained was incredible. For starters, I knew a little bit about avalanche safety from a short version of Brian’s course but really wasn’t that educated. I think many people from the Midwest think the same way I had. I used to figure that I only go out west one time a year, what’s the likelihood that I would get caught in an avalanche. I, however, was very wrong in this thinking. The information obtained about avalanche safety was tremendous and I am now happy to say I own my own beacon, probe, and shovel. The skills I learned were also awesome. The key thing that stood out to me the most though is confidence, not only with riding skill but also with avalanche safety skills. It is important to be confident in what you are doing in order to be successful. You cannot improve as a rider if you don’t have confidence in yourself and this was stressed to me constantly by Brian. It is also important to be confident in your avalanche safety skills. 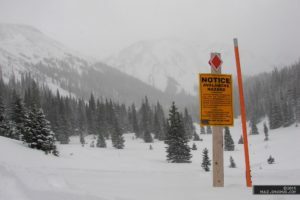 No one ever knows when an avalanche is going to happen and it is vital that you are prepared and ready to act in case an avalanche were to occur. I was lucky enough to be able to come back out and ride over my spring break in 2016. On this trip, I was able to cross off another state to ride in off my bucket list as this time I was able to ride in Colorado. This again was an amazing trip where I got to hone in on the skills learned on my prior trip. I was also able to push beyond my comfort zone and accomplish things that I didn’t think I was capable of. Overall I learned the true meaning that life begins at the end of your comfort zone. Brian pushed me numerous times when I didn’t feel comfortable but overall that created an even greater experience. I am so grateful for the opportunity to ride out west and learn about the importance of avalanche safety. I now feel confident in using a beacon and what to do in case an avalanche were to occur. I can’t wait to buy my own mountain sled and make the big move to the mountains in the future. Every time we get the chance to work with a group like this, we take the time to get our visitors outfitted with the latest safety gear and then educate them on how to use it. With an equal focus on how to use the gear in a worst case scenario and how to avoid getting your group into these scenarios to start with, we are very thankful our sponsors set us up with the gear required for the trip.